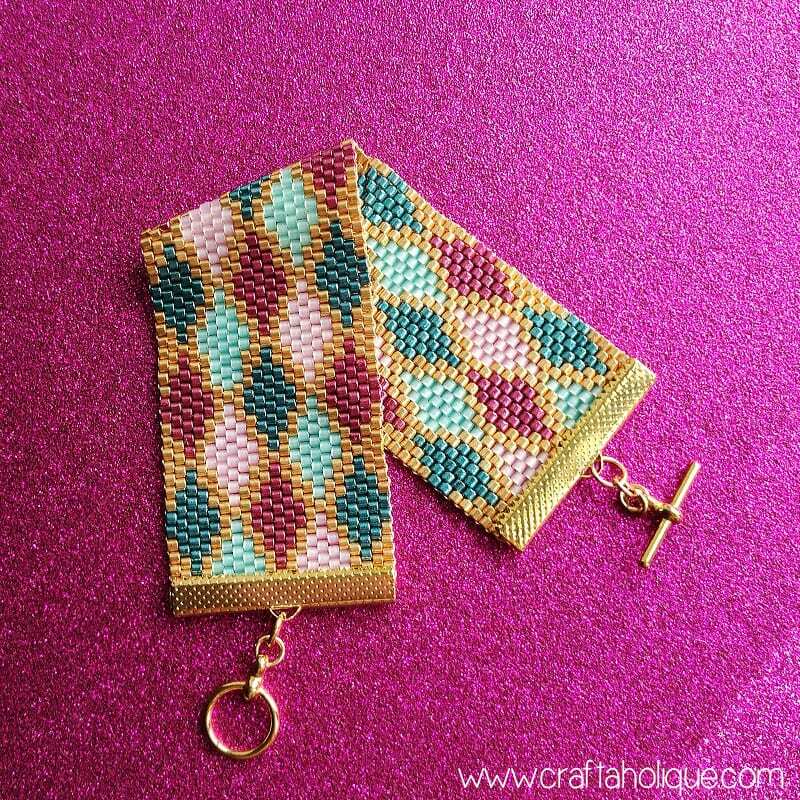 I have another fun beading pattern available today for this colourful argyle patterned bracelet! I made this using the flat odd count peyote stitch beadweaving technique. I really must get around to doing a tutorial on this particular beadwork technique, but for now, you can find out how to do it in this YouTube video, if you’re not sure. It is slightly different to flat even count peyote stitch, as an odd number of columns are used which means you have to sew through the beads a little differently at the end of a row. However, it’s easy once you get the hang of it! Miyuki Delicas size 10/0 in five different colours. Size 10 or 12 beading needle. 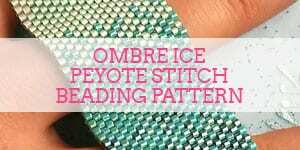 My peyote stitch cuff bracelet PDF pattern. When made up according to the pattern, the finished beadwork measures around 5.5 inches in length. With a toggle clasp added (you can see this in the photo above and below), the bracelet will measure 6.5 to 7 inches. 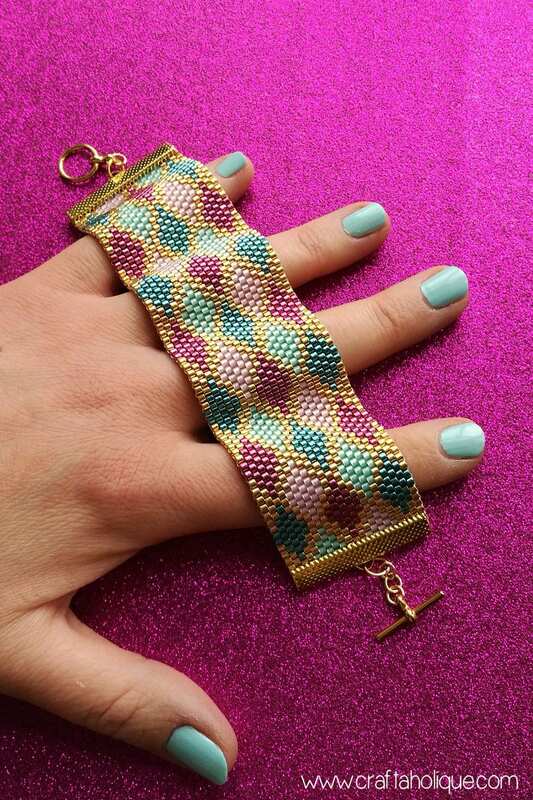 You can make it shorter or longer by increasing or decreasing the number of jump rings in the clasp or by adding or taking off a couple of rows at each end of the pattern. I’ve used metallic Miyuki Delicas for some of the beads in this bracelet as I love the way they sparkle and reflect the light. The exact colours and bead types can be found in the pattern, which is available in my Etsy shop for £4.99 plus VAT. The reason I charge for some of my patterns is to help me keep my blog up and running as it does cost quite a bit over the course of the year. I have to pay hosting and domain fees as well as invest in various materials to bring you my free craft tutorials! With that said, you’ll get a lot of value from my pattern. Bead legend with colours and bead types used. Word chart (row by row). You’ll receive the pattern as soon as your PayPal payment has been processed. Please note that materials aren’t included! But don’t worry as you can use my handy affiliate links above to source what you need quickly and easily. 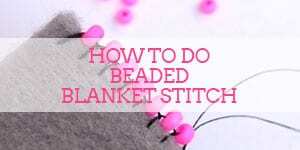 READY TO START BEADING? GET THE PATTERN HERE! I hope you like this bracelet and that you enjoy making it if you decide to purchase my pattern! Thank you very much in advance if you do. Before you go, please check out the following related posts! *Affiliate links to Etsy are included in this post. This means that if you make a purchase through one of my links, I will earn a small commission at no cost to you. 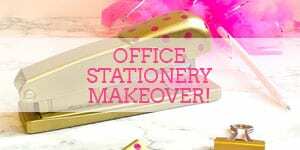 I only ever recommend products that I think are great and any commissions help me to keep this site up and running. Thank you for using my links if you’re able to. *Image source: all photos and pattern © Craftaholique. 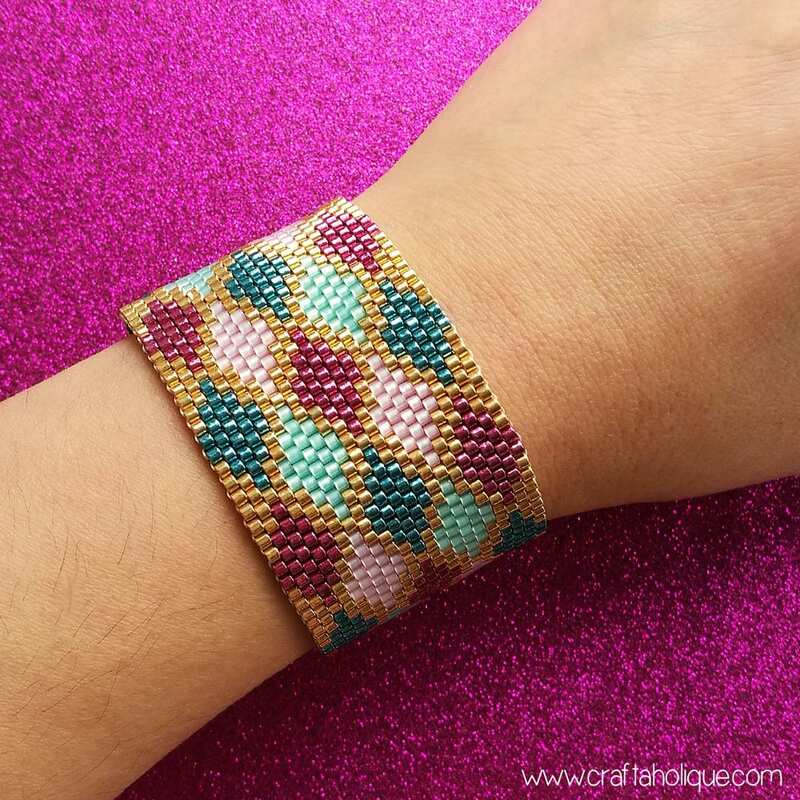 You may use the purchased pattern to make the above bracelet for personal or commercial use, but you must not resell the pattern itself as the work is copyrighted. Is this odd or even count? Hi! This is a flat odd count pattern. Thanks for your question!